Bar Diagrams for Problem Solving. A bar chart is also known to be called as a “bar graph”. This type of chart, or graph, can be always created with a professional ConceptDraw DIAGRAM diagramming and drawing software, in order to represent some kind of so called “grouped data” which is one type of all known ones of “categorical data”. Categorical data is simply the type of the statistical data consisting of the categorical variables, but sometimes also of data that has been converted into that exact form. The mentioned data is usually represented with help of the rectangular bars on the bar diagram, having the lengths proportional to the values which they represent. The bars are usually mentioned within such graph in a vertical or in a horizontal way. Sometimes, the vertical bar charts can be called as the “line graphs”. Thus, knowing that the bar graph is a chart that uses vertical or horizontal bars for showing the comparisons among different categories, you can always make your own great looking chart from a scratch using nothing else, but ConceptDraw DIAGRAM bar diagramming software illustrating the specific categories being compared on one axis of your chart as well as representing a discrete value on the other axis. Some of the bar graphs are used for presenting bars clustered in groups of over one. Many of the sources consider William Playfair to be the one inventing the “bar chart”. The reason of it was that his graph named “Exports and Imports of Scotland to and from different parts for one Year from Christmas 1780 to Christmas 1781” from “The Commercial and Political Atlas” he created was the very first bar chart in history. At the same time, the diagrams of the velocity of a constantly accelerating object against time were published in so called “The Latitude of Forms” about 300 years known to be "proto bar charts”. Bar charts are known to be scaled the way all the data fit on the chart, having the bars on the chart arranged in any needed order. Those bar charts, which are arranged from the highest to the lowest incidence are known to be called as “Pareto charts”. Usually, the bars which are used for showing frequency, are arranged in chronological sequence. Bar graphs simply provide a visual presentation of the categorical data, as it was mentioned before, and this categorical data is simply a grouping of data into the discrete groups (for example, age group, months of the year, shoe sizes, etc.). The categories illustrated on the bar diagrams tend to be qualitative, appearing along the horizontal axis in a column bar chart, having the height of the bar corresponding to the value of each of the categories. Bar diagrams are known to be different types. Thus, a so called “grouped bar chart” can be created with a usage of two or more bars for each of the categorical groups. The mentioned bars in such grouped bar chart are usually illustrated using the different colours in order to represent the particular groupings. As an example of grouped bar chart we can mention the one created by some business owner having three stores making his grouped bar chart using different coloured bars for representing each of the stores. On such chart, he might use the horizontal axis for showing the months of the year and the vertical one for showing the revenue. Bar graphs can be also used for more complex comparisons of data. Apart from the mentioned grouped bar charts, the stacked bar charts can take place, with help of which it is always simpler to represent completely different groups on top of each other. The height of the bar in this case can show the combined result of the groups. Such stacked bar charts are widely used, but they are not so helpful for illustrating the datasets with some groups of the negative values, and so grouped bar chart is better in such case as they present any given information in the same order in each of the grouping, when stacked bar diagrams are used for presenting the information in the same sequence on each bar. Bar charts are popular in very many different spheres of business activity. Thus, you can create as many as needed working as an event manager in the application of project management. Developing as well as creating different events (for example, conferences, festivals, ceremonies, formal parties, conventions or concerts) it is much more convenient to mention lots of data needed to be taken into consideration with help of such bar charts, or bar diagrams. Event management itself involves studying the brand, identifying the target audience of each company event managers work for, devising the event concepts as well as coordinating all the technical aspects before the event takes place itself. Thus, in the process of coordinating and planning the event, it is always better to use only the professional tools for arranging all the things and people who intend to take a participation in the mentioned event. ConceptDraw DIAGRAM software can be useful for planning the budgeting of event, its scheduling, mentioning the site with the description of where people will be located, coordinating transportation as well as parking for all the guests in a way of creating the needed maps and plans, arranging the décor by making the floor plans within ConceptDraw DIAGRAM software as well as making the emergency plans using the needed solutions from ConceptDraw STORE. Working in any industry, for charitable organization or interest group, you can always plan your events with ConceptDraw DIAGRAM diagramming and drawing software in order to market your company, build the business relationships, raise money for your company or celebrate the achievements. The organised trade show named Midem has been the leading international business event for the music ecosystem since 1967. 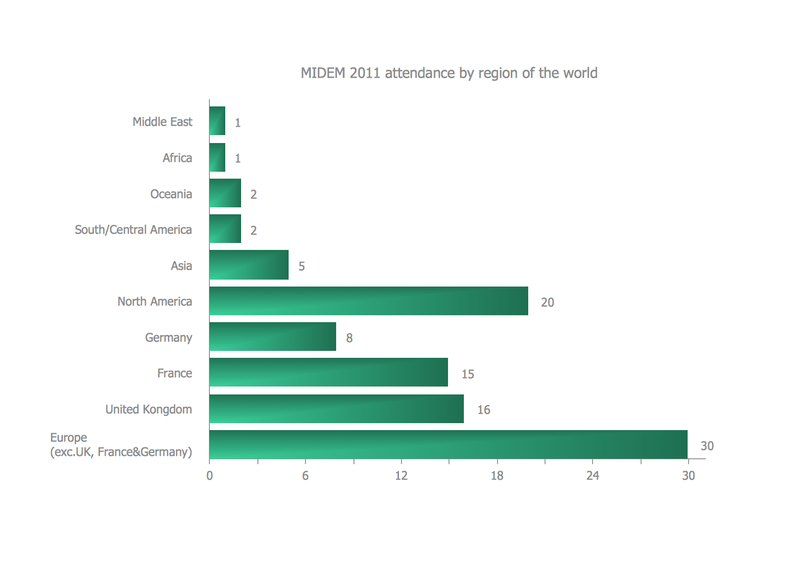 The example of the bar chart illustrated on this page shows how many organizations attended it in 2011, mentioning the countries they come from. No need for any special drawing skills to create professional looking diagrams outside of your knowledge base. ConceptDraw DIAGRAM v12 takes care of the technical details, allowing you to focus on your job, not the drawing. ConceptDraw DIAGRAM v12 delivers full-functioned alternative to MS Visio. ConceptDraw DIAGRAM v12 supports import of Visio files. ConceptDraw DIAGRAM v12 supports flowcharting, swimlane, orgchart, project chart, mind map, decision tree, cause and effect, charts and graphs, and many other diagram types. If you want to find a way to understand complex things in minutes, you should try to visualize data. One of the most useful tool for this is creating a flowchart, which is a diagram representing stages of some process in sequential order. There are so many possible uses of flowcharts and you can find tons of flow charts examples and predesigned templates on the Internet. Warehouse flowchart is often used for describing workflow and business process mapping. Using your imagination, you can simplify your job or daily routine with flowcharts. Warehouse flowcharts are used to document product and information flow between sources of supply and consumers. The flowchart provides the staged guidance on how to manage each aspect of warehousing and describes such aspects as receiving of supplies; control of quality; shipment and storage and corresponding document flow. Warehouse flowchart, being actual is a good source of information. It indicates the stepwise way to complete the warehouse and inventory management process flow. Also it can be very useful for an inventory and audit procedures. This sample was created in ConceptDraw DIAGRAM v12 diagramming and vector drawing software using the Bar Graphs Solution from Graphs and Charts area of ConceptDraw Solution Park. It is Bar Graphs example, Sales Growth example, Column Chart Example - Sales Report. 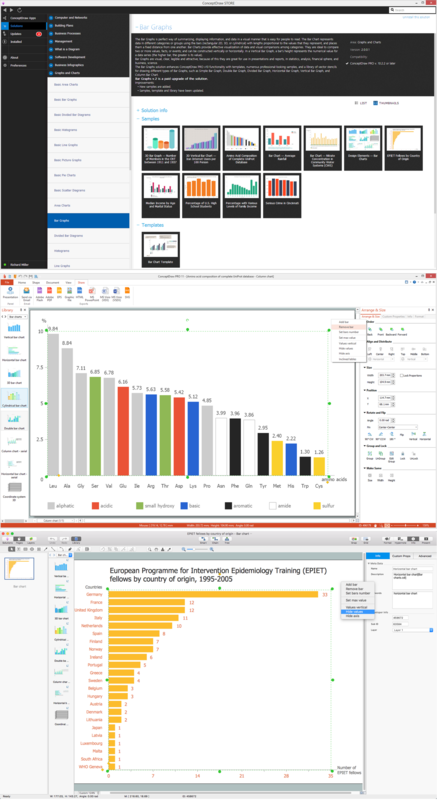 Create bar charts for business management problem solving and data comparison using the ConceptDraw DIAGRAM v12 diagramming and vector drawing software extended with the Bar Graphs Solution from the Graphs and Charts area of ConceptDraw Solition Park. Create bar graphs for visualizing economics problem solving and financial data comparison using the ConceptDraw DIAGRAM v12 diagramming and vector drawing software extended with the Bar Graphs Solution from the Graphs and Charts area of ConceptDraw Solition Park. Bar charts represent data in different categories or groups. Create bar graphs for visual solving your scientific problems and data comparison using the ConceptDraw DIAGRAM v12 diagramming and vector drawing software extended with the Bar Graphs Solution from the Graphs and Charts area of ConceptDraw Solition Park.